On Monday, October 9, we celebrated Indigenous Peoples’ Day and the contribution of these communities to global economy, governance, and culture. It is also a day to expose the ongoing suffering of indigenous peoples world-wide as a result of more than 200 years of colonization. 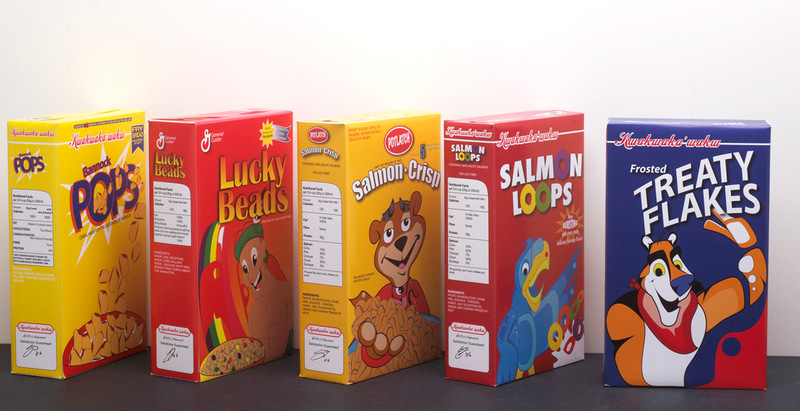 In this work of art by Sonny Assu, called Breakfast Series, we are initially confronted by the familiar colorful cereal boxes of our youth, luring us with their smiling animal mascots promoting sugar-laden cereals. Upon closer inspection, we see that Assu has turned the pop art inspired graphics on the five boxes into commentaries about highly charged issues for First Nations people—such as the environment, land claims, and treaty rights. Tony the Tiger is composed of Native formline design elements, the box of Lucky Beads includes a free plot of land in every box, and contains “12 essential lies and deceptions.” The light-hearted presentation, upon further investigation, exposes serious social issues. 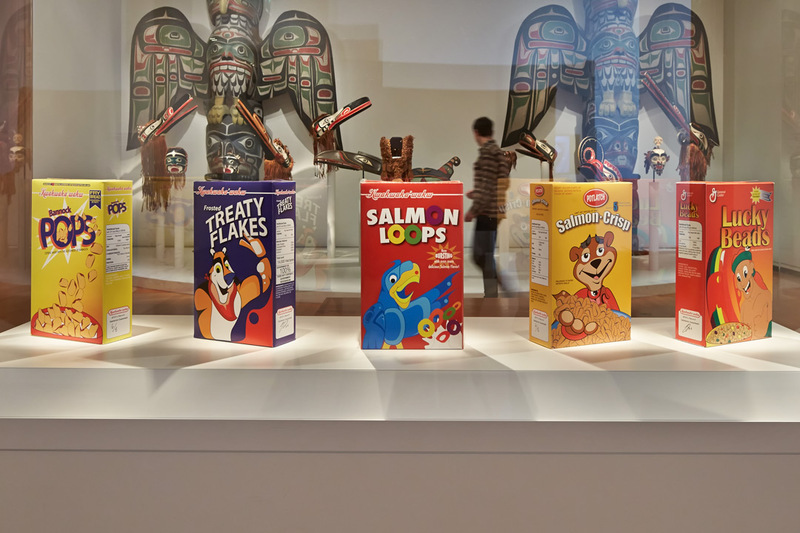 The cereal boxes and their contents become a metaphor for the unhealthy government commodity food forced upon Natives and First Nations, and that took the place of the healthy diet of fish, seafood, venison, berries, and wild greens that indigenous people thrived upon for thousands of years. Food sovereignty—the right of access and control over native foods and community health—has become an increasingly significant issue as indigenous people struggle at disproportionate rates with diabetes, heart disease, and cancer. Image: Photo: Ben Benschneider. Breakfast Series, 2006, Sonny Assu (Gwa’gwa’da’ka), Kwakwaka’wakw, Laich-kwil-tach, Wei Wai Kai, born 1975, five boxes digitally printed with Fome-cor, 12 x 7 x 3 in. each, of 5, Gift of Rebecca and Alexander Stewart, in honor of the 75th Anniversary of the Seattle Art Museum, 2006.93, © Sonny Assu.